PennsylvAsia: China Town Hall events at Pitt, October 9. 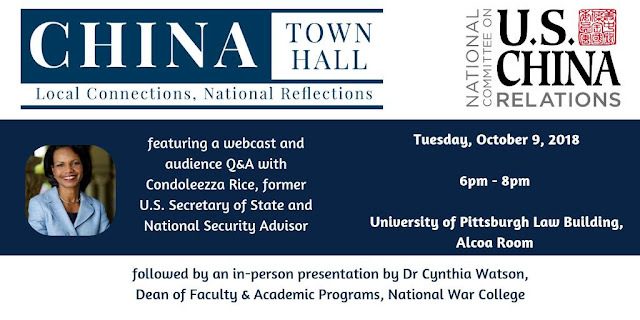 There will be two free China Town Hall events at the University of Pittsburgh on October 9 to accompany a live webcast with former Secretary of State Condoleezza Rice. One event will be held at the Pitt Law Building and will feature an in-person presentation by Dr. Cynthia Watson of the National War College. CHINA Town Hall is a national conversation on China taking place in scores of communities throughout the United States and in Greater China. The two-part event features an interactive webcast discussion and Q&A with Secretary Rice on the complex Sino-American relationship, as well as an expert speaker on-site to discuss specific China-related issues that have an impact on the local community. Opportunities to submit questions to Secretary Rice in advance will be emailed to attendees shortly before the event. Attendance is free but seating is limited, so registration is necessary. After the live webcast with Secretary Rice, our local expert, Dr. Cynthia Watson from the National War College, will give a brief presentation on China’s role in regional security. Audience Q&A will follow. The event starts at 6:00 pm and is free and open to the public, though registration is required. Another event will be hosted by the Asian Studies Center and will feature economist Martin Chorzempa. China Town Hall is a national day of programming on China involving 70 cities throughout the United States. This year's event will feature a local guest speaker at 4:30 pm. We have invited Martin Chorzempa who is a research fellow at the Peterson Institute for International Economics who will talk about China's social credit system followed by a live national webcast with Dr. Condoleezza Rice, former Secretary of State and National Security Advisor. This event starts at 4:30, will be held at 4130 Posvar Hall (map), and is free and open to the public.